Super Savings Item! 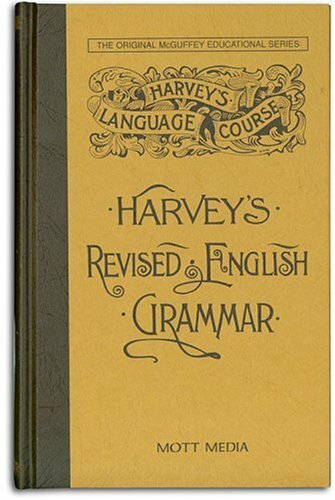 Save 33% on the Harvey's Revised English Grammar (Harvey's Language Course) by Mott Media at Translate This Website. Hurry! Limited time offer. Offer valid only while supplies last. This grammar can be used in grades 7 and 8, as well as high school. It is a comprehensive grammar in the classic sense, including four parts. This grammar can be used in grades 7 and 8, as well as high school. It is a comprehensive grammar in the classic sense, including four parts. Orthography. Study of words classified into parts of speech. Each part of speech is further studied according to classes, number, tense, mode, and other attributes which affect it as variously used in sentences. Syntax. Study of sentences, their elements, relations of parts, and so forth. Includes study of punctuation. Prosody. The study of accent, quality, and tone of language. Also rhythms and measures as used in poetry. A more complete treatment of this topic than can be found in virtually all modern grammar books. When your students have studied in such a comprehensive grammar, they can continue to use it for reference, checking on rules and definitions for a lifetime of use. If you have any questions about this product by Mott Media, contact us by completing and submitting the form below. If you are looking for a specif part number, please include it with your message.